Photo courtesy of Google image search. 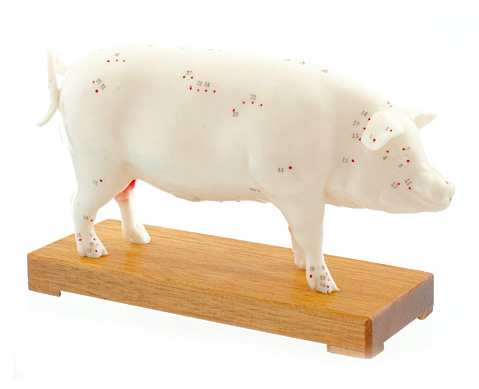 Pig acupuncture example. There are some people who don't like to use medications whenever possible. However, there are situations when medications are the only way to save a life. This is meant to be a guide with topics you can further discuss with your vet or research on your own to see if there are any that you can utilize or integrate into the care of your pet pig. We recommend to talk this over with your vet to see if any of these things may be useful in YOUR particular situation before doing or attempting ANY of these methods with your pig. Some people have exhausted all traditional types of treatment for their beloved pets, some turn to alternative methods to keep the costs down. It doesn't matter why you are researching natural healing, but you do need to ask questions and ask the practitioner what is "natural" to them and what the goal of the treatment is. Ask if there is a possibility of harming your pig or exacerbating the condition you're attempting to treat. The number one spot goes to animal communicators. These are people who are thought to be able to "sense" what may be going on and some pig parents swear by their abilities to help. They feel like these animal or spiritual persons are able to communicate with animals or feel what they're feeling through the energy of their owners/mama & daddy. I am not saying I believe, nor disbelieve in this type of communication, but felt it is vital that you know it does exist. There are some select people with a gift, but they are not abundant. Usually you can find out about true animal psychics or communicators through referrals from others that have used the services. They are used often in missing pets to help reunite them with their families as well. The number two spot will go to alternative pain management methods. 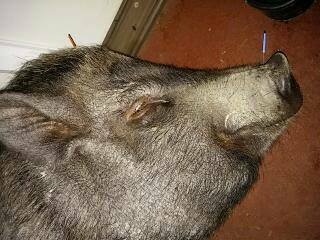 I recently learned about animal acupuncture and how much this has been done within recent years to help improve overall quality of life for some pet pigs. Dr. Kristie Mozzochio is a practicer of this type of alternative therapy and can be found in the North Carolina section of our veterinarian list. Acupuncture is not a new method, it has been practiced for thousands of years in other cultures, but bringing it to the animal world is relatively new but it has found to be very effective in some cases. Dr. Kristie is an expert in this arena and has done acupuncture on pigs and that treatment has produced excellent results. There is a variation to acupuncture called aquapuncture whereas a liquid is injected into acupressure points in an effort to increase the effect on the acupressure point as well. Another method is something we have found has been extremely useful in human medicine as well as animal medicine. It's often referred to as "Healing Touch" or "Healing Hands" but is a therapeutic touch therapy and consists of using your hands to touch particular spots on an animal (or person) ultimately classified as a mystical treatment because it is considered an energy treatment, not a physical action. Often times, there is no actual contact made with a patient/pet, but instead held above or near to release and alter energy fields around the animals in a 4 step process called centering, assessing, unruffling and transferring energy. Detoxification is another unconventional method used to detoxify an animals system by including herbal based formulas designed to target a specific cleanse such as the liver or gastrointestinal tract. Some even use colonics to cleanse, but because detoxify can have so many meanings, its important to ask the practitioner what the ultimate goal is and be sure your goals are a match. Mystical methods like therapeutic touch aren't new methods, but instead methods that don't have any reported side effects. Some others that you can look more into are aura adjustment, the use of crystals, feng shui, dowsing and pendulum assessments, hypnosis, thought field therapy, vibration therapy and zero balancing. Aroma therapy is the idea that a pleasant scent can affect ones mood is easy to understand. However, what people often forget is that an animals sense of smell is far more acute than a human and an animal can be swamped with an odor that is only mildly detected by a human, this is even more important to consider when you are attempting this method for a pig whose sense of smell is super sensitive. Some aromatherapists will massage a small amount of scented liquid onto an animal to aid in behavioral adjustments, for example. Others may add scented oil to bedding to help their animals feel more released at bedtime, but just keep in mind, these smells may be exaggerated in an animal, especially a pig due to their keen sense of smell. Definitely consult a professional before trying to do this yourself so there is no sensory overload. Rescue remedy is a spray that is often suggested as a method to help calm a pig prior to a hoof trim or car ride should a pig be fearful of these things. That is a mild example of aroma therapy. Color therapy is a newer, more basic common sense kind of therapy thats actually called chromotherapy. Practitioners have develops attempts to influence an animals physical and mental behavior with color. Who would want to sit in a room with four black walls? Animals are no different. Brighter colors seem to make people and animals happier. Although pigs have poor vision overall, from my experience, they are NOT color blind and this theory makes perfect sense to me on a personal level. calming colors tend to be warm like blue or yellow. Red is usually associated with rage, green and grey calm. Color essences is another sister therapy of color therapy where water is used in spray bottles with different colors and sprayed in the hopes the animals react to the mist of colors used for the desired effect. Nutrition therapy is one of the basics and the single greatest influence on health. While people debate over the pros and cons of manufactured feeds versus natural feed versus home cooked plans, nutritional therapy is a special therapeutic tool used to aim to exert a greater influence over health, for instance, anticipating adding supplements for stressful situations or the use of probiotics to enhance the animals natural health. Diatomaceous Earth is a naturally occurring silica rock that is porous and abrasive. It is used industrially as an absorbent, filter, insulator and an insecticide. crumbled into a powder, it absorbs the waxy outer layers of pests, bugs and insects. The damage inflicted to the pests bodies causes them to die prematurely, DE has been used as a pest deterrent in settings such as grain storage, some use DE food grade to orally worm horses or dogs, although, this is not approved or recommended by anyone with experience in the pig community. We DO recommend using anti-parasitic medications to ensure your pet pig is properly tested for parasites and giving DE directly to any animal can have side effects including weakening of the stomach wall and internal bleeding. Botanical therapy/Herbology has been around for years. Since pigs like to sample different things (ok, lets face it, pig eat everything) this is something you really need to research before putting into place at your home. Some of the agents used for herbalism are KNOWN to cause liver damage for example, so this isn't something you should look up on Google and decide to do yourself. ALWAYS consult a professional. Music therapy is actually something many of us already practice but don't realize it is a treatment. Pigs who suffer from dippity pig syndrome (a non-life threatening/short lived illness that you can read more about by clicking here) are usually soothed by music and it is widely recommended that you provide soothing music to help calm a pig who is showing signs of this illness. Reflexology used to be called zone therapy and is a theory that the body can be mapped on the foot although some proponents extend this effort to the animals ear. Specific areas of the foot are thought to correspond to various organs and those areas are thought to be susceptible to manipulation from the corresponding area of the foot. Reflexology does have diagnostic and therapeutic goals. Chiropractic and Massage therapies are therapeutic tools most of us have heard of, but have you considered them for your pig? I give my pig a nightly massage. I massage all 4 legs, the "shoulder" area and the belly, without fail...every. single. night. And if I don't? She reminds me. Laser treatments to help with healing and pain have been widely used on pigs, kinesiology, the study of movement, have evolved into kinergetics which is the combination of kinesiology and mystical energy healing and is also widely practiced around the US as well as many other countries. There are many many therapies that can be used. You have to determine if any fit into your situation or could be useful. You also have to determine what is natural and what is nonsense. Research natural healing for animals, research useful natural treatments for your pig. You will be surprised at what you're able to find. ​Sources: "Natural healing" by Lisa Preston, "Natural remedies for pig diseases" by Mark Gilbred, "Pig: The homeopathic approach to the treatment and prevention of disease" by George Macleod. 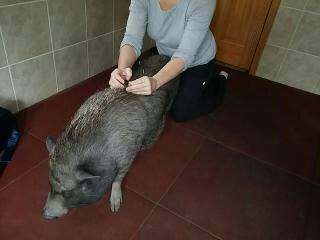 This is Dr. Mozzachio treating with acupuncture on Tina Cliff-Harvey's piggy. The benefits of acupuncture therapy are explained above. Looking at the long term healthcare cost of having an animal, holistic care is usually less expensive than a conventional approach. This is because holistic care focuses on preventing disease and relying on natural therapies rather than conventional medications – and preventing disease is always less expensive than treating a problem. There are literally thousands of documents showing the effectiveness of holistic care. It is true that nutritional supplements are not subjected to the same standards of testing as conventional drugs, but that doesn’t mean there aren’t studies showing their effectiveness (or in some cases, lack of effectiveness). In fact, many studies have shown these therapies can be more beneficial than similar conventional medications. If someone thinks there is no proof holistic care works, either he hasn’t taken time to do the research or is simply discounting it. It’s true that new things can sometimes appear “different” or “wacky”. But it’s also true that some of these therapies are now mainstream, such as nutritional supplementation, acupuncture, chiropractic and herbal therapy. Other therapies such as homeopathy might appear “wacky” when first studied, but it’s only because this discipline looks at health and disease from a totally different perspective. Careful study and questioning of different holistic disciplines can usually allow you to determine which therapies seem logical and which ones seem “far out”. Yes, holistic care often involves more work than simply popping one or two conventional medicines. For example, for patients with skin disease, I prescribe frequent bathing and three to five supplements given one to two times daily. If you are not able to spend this extra time and effort, or if your animal resists your good intentions, it may be that a conventional approach is best for you. However, I’ve found that most people can easily transition to a holistic disease prevention or treatment approach, and that most animals respond well to these therapies. There are certainly fewer veterinarians offering holistic care over those who offer a conventional approach. Over time, however, I have seen the number of holistic and integrative vets slowly increase. While many areas do not have holistic veterinarians available to see patients on a face-to-face basis, many doctors, are able to help people via phone appointments. These are very easy and reduce the stress of bringing your animal to the clinic. This way, you’re still able to work with your local conventional doctor and take advantage of the care he or she might offer, while the holistic veterinarian is able to prescribe natural therapies to further encourage your animal’s healing. If you don’t have a local holistic veterinarian, set up a phone appointment with a holistic doctor who can give you a second opinion and offer additional therapies you may not find locally. They may even know of a veterinarian in your area who practices holistic methods.